According to EDCO’s Environment Times, more than 25 million “fresh cut” trees make a great holiday statement then are discarded. It recommends recycling green garland, wreathes and trees. These can be left at recycling stations where they will be turned into valuable compost. Some communities provide pickup service. Trees should be free of tinsels, ornaments and cut to manageable length. Tom Lamb Jr., longtime member of Solbeach VFW Post 5431, has been named Distinguished Veteran of the Year by the State Assembly thanx to the efforts of Assemblyman Martin Garrick from Solbeach. Lamb has volunteered more than 31,000 hours on behalf of veterans since 1936. Flower Capital electeds have accepted a sculpture of a child that was offered by Dowtown Encinitas MainStreet Association to observe its 20th anniversary. The art figure was sculpted by Flower Capital resident Manuelita Brown, whose work is displayed in other cities. Longtime Surfside City resident Alice McNally has asked council electeds to spare a eucalyptus tree in front of her home from the wood chopper’s ax. Removal of the old but stately tree was approved last fall after a neighbor said its roots were encroaching on the sidewalk and street and it was in danger of falling on a residence. A Save The Tree campaign is ongoing while the council electeds consider the issue. When San Dieguito Academy decides to establish a Hall of Fame for its outstanding athletes, Edith “Edie” Bollinger should be high on the list of candidates. She passed away recently. In the 1940s, Edie was a star softball pitcher. Hitting her fastball was a challenge for boys and girls as well as adult players — men or women. She always drew a big crowd when a jockey team provided the competition. They were more apt to win on a longshot then to connect with one of Edie’s pitches unless she allowed them to for fun. City of Solbeach is seeking residents to serve on 16 slots open on five commissions. These include Budget & Finance, Parks & Rec., Public Arts Advisory, Public Safety and View Assessment. No pay but great satisfaction in serving. 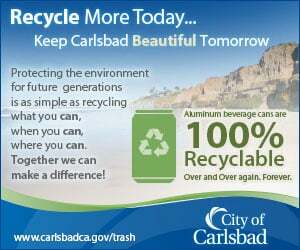 Info is available by calling (858) 720-2400. Deadline is Jan. 19. According to an AP report, L.A. Council electeds are considering an ordinance that will prohibit feline declawing. City of Angels follows Beverly Hills, Santa Monica and San Fran with such a law. San Diego Assn. of Governments has under advisement how to limit public comments on agenda items that involve spending. With tough economic conditions, how electeds spend their tax $$$$ is of great interest to most folks. Likely coming to some communities are gambling casinos that are miles from the reservations that are sponsoring them. Applications for them are already in the works and legislation to legalize them is likely becuz of cozy relations between state electeds and casino operators. The more gambling sites the higher the campaign contributions. An effort to build the country’s larget landfill two miles from Joshua Tree National Park in Riverside County is still stalled. It’s been in the application process for more than two decades. A federal appeals court recently ruled the project, identified as Eagle Mtn. landfill, had submitted flawed information to the Bureau of Land Management. Pop/Latin artist Julio Iglesias is the first of the major grandstand performers contracted to appear at the San Diego County Fair that will run from June 11 through July 5. Iglesias will entertain June 25. According to Diane Langager, principal planner for the Flower Capital’s North Coast Hwy. 101 Streetscape, the project will be on the Jan. 13 Flower Capital City Council agenda. A video of community workshop No. 4 is now available for viewing on the city’s Web site. Bids to construct a quiet zone in the Harbor City involving federal, state, city and railroad participation are due out this month … San Diego County Regional Airport Authority has enacted tougher spending regs for out-of-town junkets by members of the nine-member board and staff as the result of previous lavish spending … Community Resource Center has celebrated three decades of helping folks who need help the most … Virginia is the latest state to prohibit smoking in restaurants and public places … North County Transit District has axed 10 more trees on its right-of-way between La Costa Avenue and Leucadia Boulevard … Highly successful Powerhouse Community Center in the Surfside City recently celebrated its 10th year of operation … Hollandia Skatepark is open again after being shuttered several times becuz participants ignore safety helmets … Mt. Soledad Cross is being reviewed for the umpteenth time by a federal court acting on an appeal of a previous ruling … Widening of Highway 76 from two to four lanes in some places is under way after years of dithering … Leucadia Farmers Market at Paul Ecke Elementary School every Sunday from 10 a.m. is reported to be doing good biz … During a recent campaign to remove unwanted prescription drugs from homes, folks turned in more than 90 pounds of the stuff at a fairgrounds collection station. Del Mar as SoCal horse racing center? Minor league coming to North County? Community garden coming to Encinitas?